Milwaukee Brewers outfielder Christian Yelich hits a single March 31 against the San Diego Padres at PETCO Park. Christian Yelich is back in the starting lineup for the Milwaukee Brewers on Wednesday, a day after being activated from the 10-day disabled list. The outfielder, who was acquired in an offseason trade with the Miami Marlins, had been sidelined with a strained right oblique, limiting him to six games so far this season. 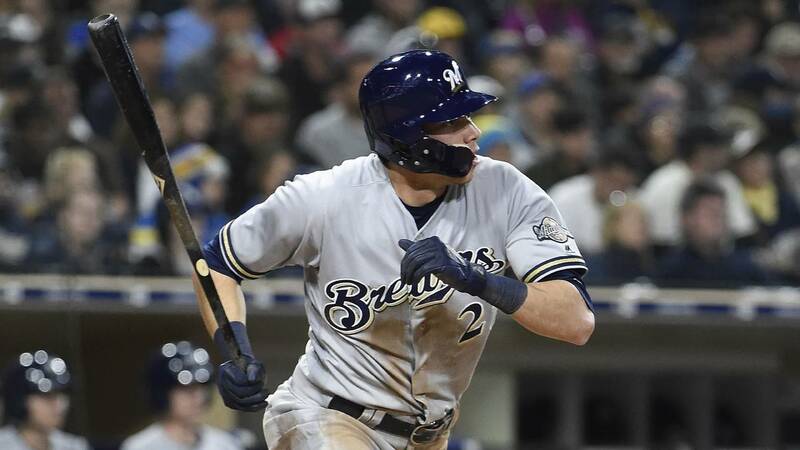 Yelich, who is hitting .385 with one home run and five RBIs over those six games, was available off the bench Tuesday night in the Brewers' 2-0 victory over the Cincinnati Reds but did not play in the game. Brewers manager Craig Counsell penciled Yelich in second in the batting order for Wednesday's series finale against the Reds at Miller Park. The Brewers, who are off to a 9-9 start on the season, are counting on Yelich's power this season. The 26-year-old hit a career-high 21 home runs for the Marlins in 2016 and then followed that up with 18 homers last season.